Don’t be intimated by making béarnaise sauce. As James Martin shows, it’s simple to whisk up and perfect with steak. Equipment and preparation: You will need a deep fat fryer for this recipe. For the béarnaise sauce, place the vinegar, white wine, peppercorns and shallot into a small saucepan and bring to the boil. Simmer until the liquid has reduced by half. Remove the peppercorns, then pour the mixture into a medium heat-proof bowl. Place the bowl over a pan of simmering water and whisk the eggs together until thickened and light in colour. Gradually add the melted butter, whisking constantly. Turn off the heat and leave the bowl over the pan until ready to use. For the steak and chips, place the potatoes into the fat fryer, a few at a time, and cook for 2-3 minutes, or until just tender but not coloured. Drain on a plate lined with kitchen paper and turn up the fat fryer to 190C/375F. Season the steaks with salt and freshly ground black pepper. Heat a frying pan until hot, add the butter, olive oil and the steaks and fry on one side for two minutes (without moving the steak), or until browned. Turn the steak over and cook for another two minutes, then remove the pan from the heat and leave the steaks to rest. Place the semi-cooked chips back into the fat fryer in batches and cook for another 2-3 minutes, or until golden-brown and crispy. Keep warm on a tray in the oven if necessary. 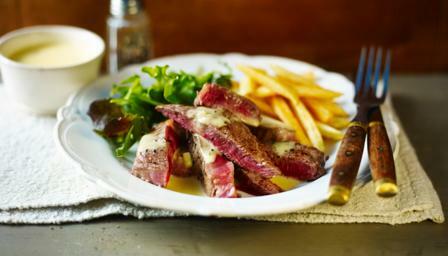 To serve, carve the steak into thick slices, place onto plates and spoon the béarnaise sauce over. Pile some chips and salad leaves alongside.